Or have they unfinished business with you from Gustafsen Lake in 1995? Before the NDP is voted in on Tuesday, we should recall one thing. In 1995, the New Democratic Party launched an assault against seventeen Sundancers at Gustafsen Lake which involved 77,000 rounds of ammunition and the presence of Canadian Army Armoured Personnel Carriers. Premier Mike Harcourt and the infamously double-cast Ujjal Dosanjh – Minister of Human Rights and Attorney General, explained to the media that the Sundancers were terrorists. The trial, when the Sundancers eventually realized that BC fully intended to kill them all so they left the camp – after a month – was the longest criminal trial in Canadian history. The province’s position was that this was a criminal matter which could not be excused as in any part related to the denial of indigenous land rights. The Ts’epeten Defenders’ lawyer had already been locked up and, although he gave three weeks of testimony in handcuffs and a red jail-issue jogging suit, the judge disallowed their argument. The resulting court case sent men to jail for weapons charges. One died later in conditions caused by his probation, JoJo Samson. Another spent four years in a high security prison – William “Wolverine” Ignace. A third, OJ James Pitawanakwat, has spent the last thirteen years in exile, unable to return to his Ojibway homeland because he violated probation orders. Eight people came away with criminal records for mischief. 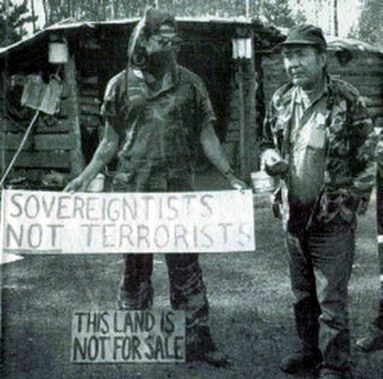 The reality of “sovereigntists not terrorists,” the Defenders’ reply to the CBC, RCMP, BC government and mainstream media slander, was not heard and certainly not reported in the press. “The rights outlined in this treaty are the final rights of Nisga’a - we’re not interested in defining title for other aboriginal groups to come at us with, and that’s the end of it—no debate. That certainty, BC’s investment certainty, is the only guarantee BC’s NDP are looking for today. They seek the same thing the Liberals do: the legal right to do as they wish with indigenous lands, which are the international subject of the right to free, prior and informed consent of the parties whose Interests lay with the disposition of those lands. BC continues to deny every manifestation of indigenous rights – even after the UN Declaration on the Rights of Indigenous Peoples, which specifically says indigenous peoples have the right to own their homelands and resources. Canada and BC are in denial – they refuse that p[art of the Declaration, and other parts, saying that Constitutional protections of aboriginal rights are superior. If you vote for the NDP, trying to oust the anti-education, anti-social policy, anti-human rights, anti-environment Liberal Party, you are voting for a party whose last acts in office were to seek to indemnify the province against indigenous claims – if not silence them by force. One would be better to refuse a vote for the NDP on consideration of the fact that they owe an apology to the Secwepmec for wrecking their lands; to the family who lost a son; to the BC public for misleading them into a small war of extermination; and to the people who lost years in prison and exile – and if the NDP are voted in without giving it, the statement by voters is that they don’t care. The very least they owe the people of BC is a judicial inquiry into the events at Gustafsen Lake in 1995, but they flatly refused that at the time and seem to be unable to recall the situation, or the fact that indigenous land rights are as paramount now as they were in 1995. There are plenty of decent independent candidates to consider, and consider them we should. In BC, the two party system has proven infinitely more effective at centralizing and concentrating power than the one party system has in other countries. Every four years, the electorate believe they have a choice. But, to quote an old friend who was quoting an old friend, ‘no matter who you vote for, the government gets in.’ Unless you vote in a party who will change the bureaucracy, the policies; not merely adjust the margins. People want to be part of mainstream, they don't want to vote for some "obscure" independents. This is how human psychology works. Even if certain individuals know what the crowd is doing is wrong, they would rather turn a blind eye to it to not isolate themselves. Isolation feels bad, because we are social animals. Just remember the Vancouver Olympics, the mainstream wanted to be happy about the upcoming party, they did not want to worry about protecting Indigenous lands from Olympic facility construction. It is just a sad reality.